You do know that holding down the shift key makes it scroll 10x faster, right? Or you can click on the field label and use the scrubby slider to change the value. I know. But I'm used to all other input fields it adds the whole pixels. 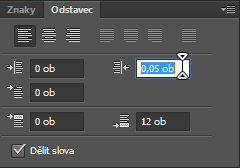 In this panel, you must always hold shift, to give useful pixel increment value. This is extra work. :-) I can not imagine a situation where someone would want to move the row 0.05 pixels down. Yet other people can and do want very fine control over the layout of their type. Plus, not everyone is working in pixels. It sounds like clicking on the icon/field label and scrubbing is probably your best choice to move the values quickly.